What makes a small car great? Is it the interior, exterior or the amount of awards it has received? In the case of the 2013 Ford Focus, it's all three. And since there are so many Focus models to choose from (sedan, hatchback, ST and Electric), buyers have a huge amount of flexibility and customization options as well. Edmunds.com writes: "While the handsome exterior of the Focus might be what initially sets the hook, it's the upscale passenger cabin that will reel you in. The interior is attractive and quiet, and the materials are best-in-class." While those are some kind words, Edmunds isn't the only group singing the Focus' praises. 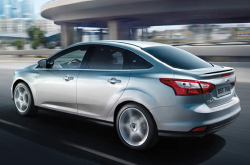 The 2013 Focus was awarded a Top Vehicle Safety Rating by the NHTSA for exceptional crash test scores. If all of that sounds great and you're considering purchasing one, you're not alone: Through the end of last year, the Focus was the top-selling nameplate in the world. To learn more about the 2013 Ford Focus' features, specs, trim levels, mpg ratings and more, simply scroll below the YouTube review video below and start reading up on Dallas' favorite car, the Ford Focus. Check out the 2013 Ford Focus next to versus similar autos like the 2013 Chevrolet Cruze, Hyundai Elantra, Mazda 3 and the Honda Civic, and you will realize that the 2013 Focus beats out those vehicles in oodles areas. Pay attention to the reasons see why! Your Ford should be treated in the best way possible - that means Ford factory- trained Focus technicians, authentic Ford parts, and the sense of bliss that comes from a 12-month service dealer warranty. Grapevine Ford service and auto repair in Grapevine is a click away! Keep your Focus running efficiently; have it serviced by Grapevine Ford's skilled car repair mechanics. We can take on everything - from windshield wiper or tire switch outs to standard oil and filter changes; we also handle the tough stuff, including Ford transmission repairs and more. For inexpensive, reliable Ford car repair in Grapevine, the primary place you should take your Focus is Grapevine Ford. The succeeding link is your boulevard to outstanding savings. Click now to be taken to to Grapevine Ford's specials. Driving a 2013 Ford Focus in Dallas is a no-brainer. With its cool combination of style, fuel efficiency, safety and value, you can't go wrong with this award-winning car. Grapevine Ford carries a large inventory of Focus sedans, hatches, ST models and more. And now that you've read a review of the Ford Focus, it's time to test drive one! Contact Grapevine Ford by filling out the inquiry form located at the top right of this page, or simply stop by or call. One of their helpful reps will schedule a test drive so you can experience this sporty little car for yourself. It's a short drive to Grapevine from Dallas or Fort Worth, so hop in the car and make the trip! Grapevine Ford is often able to offer better rates and prices than other Ford dealers in Dallas, so before you purchase a Focus from the other guys, try Grapevine Ford.